Did The Osaki OS 3D Pro Cyber Massage Chair Pass The Test? 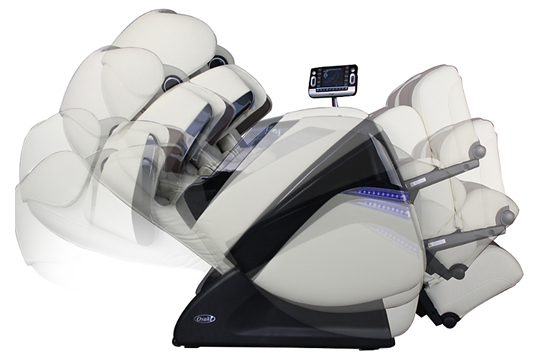 Did The Osaki OS 3D Pro Cyber Massage Chair Pass The Test? After a premium massage chair, and considering the 3D Cyber Pro? The OS 3D Pro Cyber Massage Chair from Osaki is one of their mid range chairs, and here we're going to give a detailed look into whether or not this particular model has the required features and quality to be considered a “Luxury” model. Are There Any Problems With The OS 3D Pro Cyber Model? The OS Pro Cyber includes a lot of extra features that some of their lower priced models such as the Osaki OS-4000 Massage Chair, and the OS 4000 T (not to mention other models, like the 3700B, 4000LS, 4000CS, etc) simply don't offer. It's about double the price of Osaki's lowest end models, so you would expect a decent amount of extra features and capability from the OS 3D Pro Cyber. 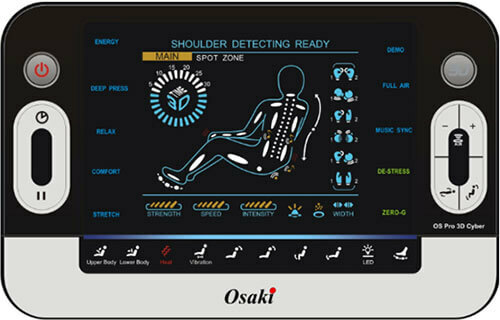 Not only does the Osaki OS 3D Pro Cyber aim to beat out it's lower end cousins of the same brand, but some of the online feedback suggests that it actually does such a great job in providing an excellent quality of massage along with its many features, that it manages to provide a better experience than some of the much higher priced options within the luxury massage chair space (like the Inada Dreamwave for example). Out of all the features which will be looking at more closely further on down the page, probably some of the most significant for this model and which help it too stand apart from Osaki's lower priced models, include the; “Evolved” and more advanced 3D massage technology, LED Chromotherapy Lighting, Accupoint Technology, MP3 Connection, Leg scan technology and arm and hand focused massage. If you have been studying up on massage chair at all, which you probably have as you are here reading this, then you're already probably aware that Zero Gravity technology is one of the standard features for most of the more luxury (and higher priced) massage chairs. “Zero Gravity” basically refers to an optimal body position in which the pressure of gravity is displaced more evenly over the entire body, so that compressional forces are reduced. The term “Zero Gravity” is somewhat a clever use of marketing lingo, and the chair does NOT actually create a state of no gravity (that would be somewhat miraculous). The OS 3D Pro Cyber has 2 so called zero gravity positions, the first one which is turned on by a single push of the zero gravity button, is the standard position which has the 30 degree tilt of the seat, and a 120 degree articulation between the seat and the chair back. The ottoman does raise a little in this position too. The 2nd stage of Zero Gravity is initiated when the same zero gravity button is pushed for the 2nd time. This is not a “true zero gravity position”. In this position, the chair reclines even further, and the chair reclines to almost a horizontal position. this is not a true zero gravity position, but is an added option if you prefer to lie even further horizontally. The OS Pro Cyber from Osaki is another chair to incorporate 3D roller technology. This means that the rollers in the chair move left and right, up and down, AND back and forward in terms of their relative position to your spine. This feature means that you get a much more thorough massage experience, and the 3D rollers used in the design of the Pro Cyber are said to enable an exceptional range of movement, so much so that on the most intense setting, the chair has been said to provide one of the more intense back massages out of any chair on the market. Luckily the rollers can be retracted to a less intense setting, so for those of you reading who prefer a more gentle massage, then not to worry, this model will cater for you too. The computer body scan allows the chair to map your specific back/spine shape, and therefore provide a better massage by creating a more customized programme based on your body shape. The Pro Cyber uses 36 air bags in total to provide a flexible and powerfully relaxing system, which integrates well with the many different auto and manual programmes that can be selected. The arm air massage feature is another feature included in the 3D Pro Cyber that you often won't find with the cheaper models, such as the OS 4000. This feature uses a sequential airbag system, instead of just using one large airbag for each side and for each arm. They inflate in order starting from the top of the forearm, all the way down to the hands. There is also a space in between the actual air bags, the wall of the arm rest. This is to prevent the arms from being pushed out of their place during the arm massage. When you first turn on the chair, like other Osaki models, the 3D Pro Cyber will automatically recline back a little. This is so that the rollers don't push you forward and out of position. The Osaki Pro Cyber also includes LED blue lights, which are hidden until you turn on the chair. They are positioned on either side of the chair. The lights come on during your session, and when in a darkened room, will be seen reflecting and glowing off the surrounding environment. If you weren't already aware, Chromotherapy is an alternative therapy which goes by the pretense that certain colours can affect mood and well being. Whilst there's not a lot of solid scientific evidence behind this, it may help to make you even more relaxed whilst getting your massage. You can read more about it on wikipedia here. Regardless of the science, we all know that candlelight for example can be very relaxing and help us shift into a more relaxed mood and state of mind, and so it's the same idea with this “Chromotherapy”, except the lighting is blue. There are said to be 350 accupoints on the human body, with 100 just within back and neck areas alone. This feature allows the chair to target these points, and work on them to provide deeper therapeutic benefits and relaxation. Many of the cheaper chairs will not include a proper massage roller unit in the foot area, and instead will usually just rely on air bag technology. Generally the consensus here is that a proper foot roller functionality makes the chair much more effective and able to deliver a much better full body massage. Luckily the OS 3D Pro Cyber includes dual foot roller massage technology in this area, so you're covered with this model. The Pro Cyber also includes heat therapy in the lower back, which definitely adds well to any massage session, as heat therapy is a well known adjunct to massage therapy. The Pro Cyber accomplishes this by using 2 heating pads placed in the lower back area. Another one of the features that makes this model stand out is it's twisting action, which really can increase the “human feel” of your massage sessions. The air bags in the mid-upper area of the chair are programmed to inflate and deflate at separate times, which means the body will experience a twist and this can allow for an extra stretching and even deeper relaxation from your massage. The MP3 connection allows you to plug in your device so that you can play music through the Pro Cyber's speaker system. You can of course plug in any device whether it be an MP3 player, smart phone or other. As long as it has the headphone jack input. The location of this input is placed just around where your left shoulder is positioned when seated in the chair. This is a little bit of an awkward position, and probably could have been improved upon in the design, because it means it's a bit hard to get to when you are already sitting. The speaker system is one of the best quality that you'll find in any massage chair, and gives out a high quality sound. The remote controller on the Pro Cyber is quite well sized, and includes large easy to read lettering. There is a single button for power, it's easy to select an auto program, and the overall design is intuitive and pleasing on the eye. As you can see, the remote control is positioned to the user's front right as they sit in the chair, and held in place by a flexible arm. I believe the arm can also be placed on the opposite side, as is your preference. The only issue that some people have commented on with this remote is that it may be a little harder to read and use in direct daylight, although the buttons are back-lit. Again, you can see the remote controller below, for convenience. Depending on the individual's leg length, the calf/foot massage function of the chair is able to make adjustments, ensuring that the massage air bags are concentrating on the correct areas. At first when the massage begins, the Pro Cyber fully extends out and then retracts. When you feel that you've reached the perfect length for your personal size, then all you have to do is push your toes down into the chair, and it will stop in that position. There are airbags positioned both underneath, and on top of the forearms, this allows for a good amount of pressure from the chair when working your arms. As mentioned above, the Pro Cyber uses proper spinning foot rollers. But it also incorporates the use of multiple air bags, which are positioned around the sides, and on the back of each leg. This enables the chair to provide an excellent compression massage. With this model, you have a little more flexibility than cheaper Osaki models, in that you can program the chair to run from anywhere between five to thirty (5-30) minutes during your session. The reason the chair has a timer is so that you don't fall asleep during the session, which might be hazardous. At the time of writing, in terms of feedback online, especially on Amazon.com, the number of reviews is somewhat limited. There are 4 reviews on Amazon.com, but it's showing that none of them are from verified purchases. It's possible that this is because the reviews were left before the integration of the new amazon reviews verification system, as I've noticed this on several of the massage chair products being sold on Amazon. Having said that, from the customer reviews that are available at present, we can see that the overall feedback for this model has been very positive. Sourcing from the reviews available, we can see that people found the chair to provide an excellent level of relaxation. One reviewer commented that they had not actually bought the chair yet, but had been using it regularly at their workplace, and the only thing stopping them from going ahead and getting the chair was the price, which was out of their personal price range at the time. Among the other positive feedback, specifically people where impressed with the quiet operation of the OS 3D Pro Cyber, how nice the chair looks, and of course, its ability to create a deep level of relaxation for the chair user. One reviewer mentioned that they were impressed by the chair, and it was indeed comparable to the Inada Dreamwave (Which if you don't know, is a much higher priced massage chair). On the negative side regarding this particular piece of feedback, this same review mentions that they feel the automatic body scanning feature of the chair is not up to scratch, and lets down the excellent mechanical ability of the chair's massage roller system. Like most of these massage chairs, the OS 3D Pro Cyber does have some apparent problems, making it less than perfect. One of the issues that's been stated, as mentioned above, is that the chair's auto body scan is not really up to par, and so could be improved upon. Another very slight issue is that the remote control may not be as easy to see and use when it's being used in direct sunlight, despite the fact that it was designed to have back-lighting for each remote control function. While being very high quality in terms of sound quality from the speakers on the Pro Cyber, the positioning of the actual MP3/smart phone jack could have been more well thought out, as it's a bit clumsy to access while you're already sitting down. However this can easily be navigated by simply setting up your music before you get seated, and enter your massage session. For this reason, whilst you may be able to find the product on many other smaller online vendor sites, the preferred recommendation is Amazon.com. They are pretty much the biggest online shopping portal on the planet, and so you'll have a high degree of shopping and transaction security, as well as the customer service aspect. We have researched and covered all the most common questions regarding the Osaki OS 3D Pro Cyber from customers either on Amazon, or other sites online. How hard is the installation/setup for the OS Pro Cyber? What is the warranty for this particular model? 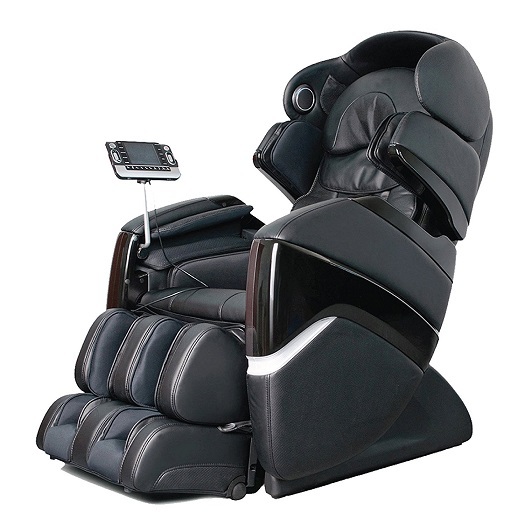 Like all the Osaki massage chairs, the OS 3D Pro Cyber massage chair is manufactured in China. Is this chair really intense on the lower back? Some users have said that when the chair is fully reclined (I'm guessing in the 2nd setting of Zero Gravity mode), then it can be a little hard on the back. But this will largely depend on how intense you like your massage to be. Does this model also work the glutes? Yes, this chair's features means it works the glutes as well as the back, arms, feet and hands. What colours is the Pro Cyber model available in? 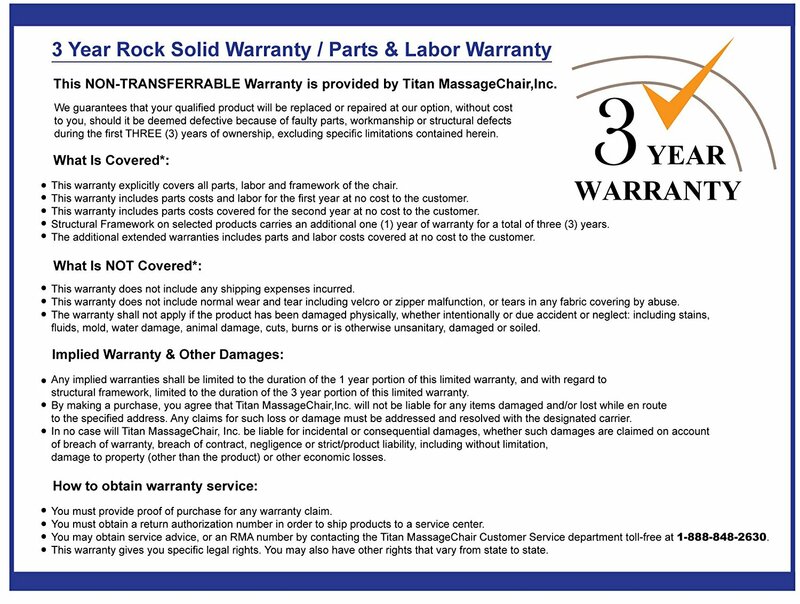 How does this chair come when shipped? It comes in 2 separate boxes. Unless you order the “white glove” delivery service (if available) then there is some assembly involved. That being said, it's been reported by other buyers that it's relatively easy to put together, and this can be achieved by oneself. However, if you can, it's always a good idea to have another person around to help you with the assembly, especially if you have any injuries like a bad back, etc. What's the difference between the OS 3D Pro Cyber, and the OS 3D Pro Dreamer? The Pro Cyber has more intense foot rollers. The Pro Cyber has a slightly longer roller in the back (approximately 1 inch difference). The Pro Cyber's MP3/Smart phone port is slightly less convenient to access than on the Pro Dreamer. The Pro Cyber's shoulder and thigh airbags give better compression. The Pro Cyber's airbag housing is said to be more comfortable than that of the Pro Dreamer. The Pro Cyber's speakers provided better music quality than the Dreamer's according to some reports. Your feet may slip out of the Dreamer during the stretch incorporating programs, depending on your height. The Pro Cyber seems to be a taller, narrower shaped chair when compared to the Pro Dreamer. In terms of noise levels while operating the chair, the rollers are said to be quieter in the Pro Cyber. Does this chair provide any heating functionality? Yes, the Pro Cyber features heating in the lower back area for increased comfort and relaxation. Conclusion – Is The Pro Cyber Really Worth The Price? If you are considering a massage chair that's somewhere in the mid range, then the Osaki OS 3D Pro Cyber could be an excellent choice. Similar to the Pro Dreamer in many ways, and actually better in some ways (as discussed above), this chair offers a cheaper alternative from Osaki if you still want to get some excellent luxury features but save yourself a little on the investment. With excellent features such as it's 3D massage technology, hand/arm focused massage air bags, dual position Zero Gravity, and Shoulder, Lumbar & Hip Squeeze & Twist you get a lot from this chair that you simply won't find with cheaper models of Osaki, like the OS 4000 series. So in conclusion, if you are looking for the mid range of massage chair technology, then the OS Pro Cyber is an excellent choice. Product Description: The Osaki OS 3D Pro Cyber is one of the mid range massage chairs from premium massage chair manufacturer Osaki. This chair features a good range of features, and is priced for the family or individual who's looking to get some great features, and is willing to spend a bit more than the minimal for a great massage chair.